Evelyn Gary Boudreaux was born on September 3, 1916 to Fils and Ada Gary in the Charonge Community. She was one of 8 children. Her parents owned the only store in the community; therefore, the store was the gathering place for all those in the community. Ms. Evelyn spent her childhood days playing and visiting with her siblings and neighbors in the small community. She also spent her days helping her mother and father in their store. Ms. Evelyn attended school in Erath, and upon graduation, enrolled at SLI (now UL Lafayette). She obtained her teaching certificate in two years, and got her first teaching position at Erath Elementary School for the 1938-1940 school year. Ms. Evelyn taught school in Erath for 34 years, touching the lives of all she taught. She was known for her deep compassion for her students, and her desire to make their lives better through education. Ms. Evelyn retired in 1974 in order to care for her husband, Dewey, who was dying of cancer. 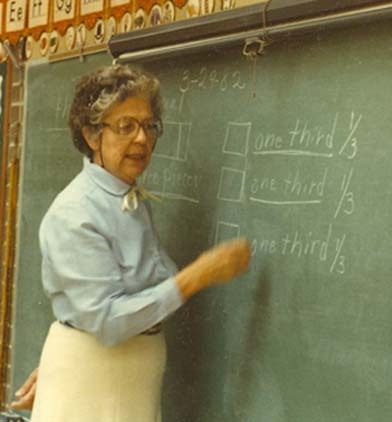 Mr. Dewey died within the year, and she soon went back to teaching as a substitute teacher. She did this until her 70th birthday, and enjoyed every moment. Ms. Evelyn and her husband were co-owners of Boudreaux-Gary Hardware Store in Erath with her brother, B.J. “Boy” Gary. She was also very active in the community. She was a charter member Erath Court of the Catholic Daughters of America and the American Legion Derouen Moss Auxiliary Post 279. As a member of the American Legion Auxiliary, she served as its first president when the organization was founded in Erath. Ms. Evelyn also served as a member of the Ladies Altar Society at Our Lady of Lourdes, and was a member of the choir for many years. Ms. Evelyn loved to play bourree, and never missed a game. She played several times a week, up until the time of her death. She also loved to cook and an avid sports fan, cheering on the Bobcats, LSU, and the Braves every chance she got. Ms. Evelyn died of cancer on November 30, 2001 at the age of 85. She was survived by her two children, Dewey Jr. and his wife Janice, and Junita and her husband Ralph. She was also the grandmother of four, and the great-grandmother to two. She is deeply missed by many.